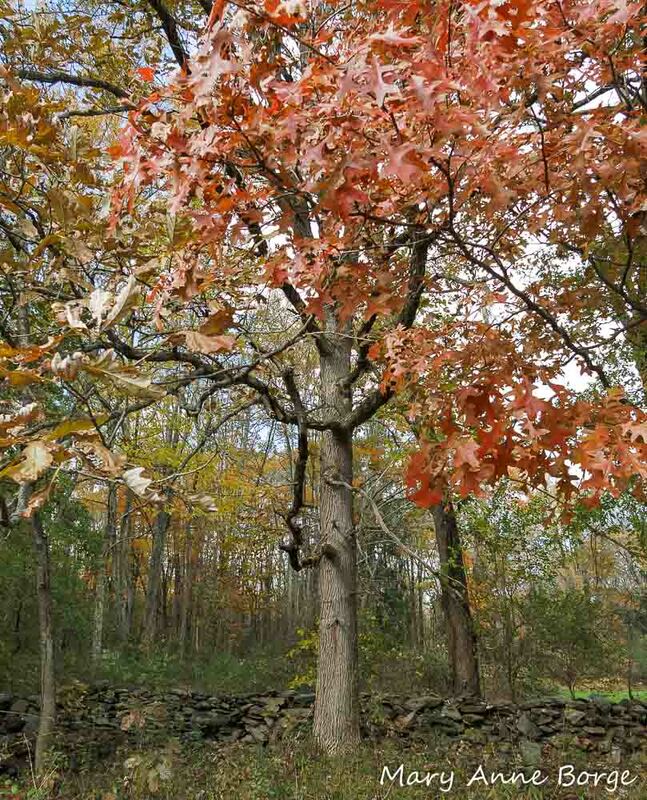 In late fall and early winter, oak (Quercus species) trees often stand out from their forest companions, refusing to let go of their richly colored russet and brown leaves long after other deciduous trees are completely bare. Oaks are members of the Beech (Fagaceae) family, and winter leaf retention, or marcescence, is a family trait. American Beech (Fagus grandifolia) trees tenaciously hold their leaves until early spring when new leaves are preparing to emerge. 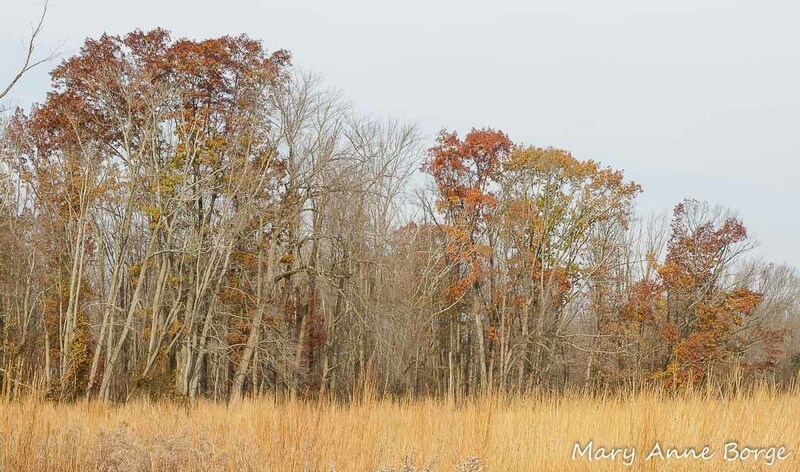 Oak trees, retaining their leaves, stand out in a woodland in late fall. No one knows exactly why some deciduous trees exhibit this characteristic, but there are several theories. It may be that the dry leaves are a deterrent to winter browsing by deer, moose and other mammals. Holding on to leaves until spring may be the trees’ way of time-releasing nutrients for recycling into the soil. Or the leaves may capture and funnel more snow melt to the tree’s root system. 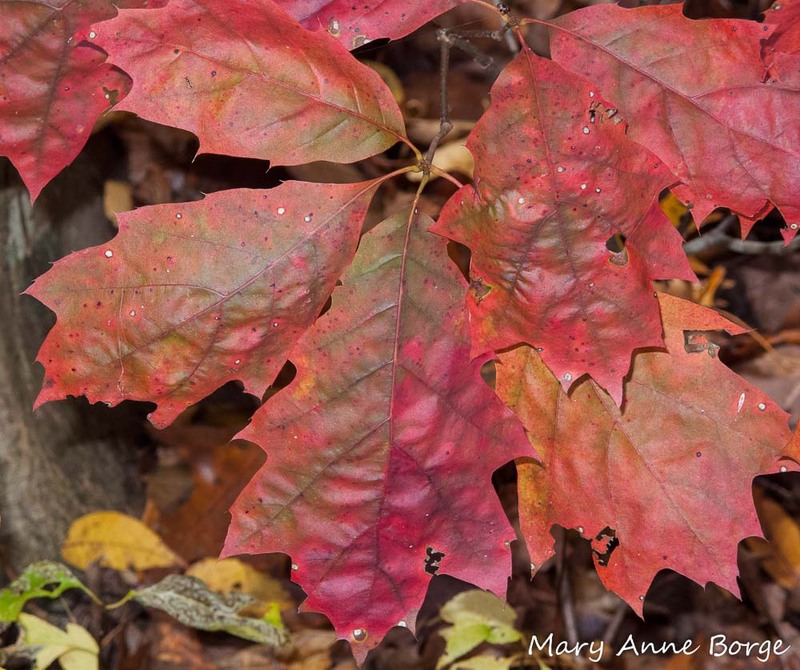 while trees in the red oak group have leaves with pointed lobes or with very narrow ‘pins’ at the tips of their lobes. Oaks are among the most valuable species for supporting both wildlife and people, in many different ways. 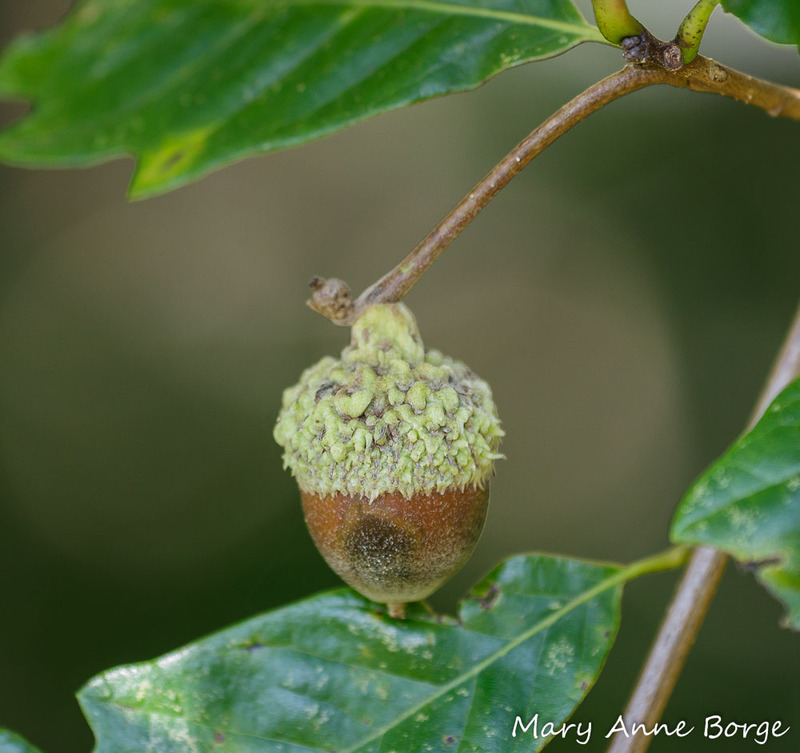 The wind-pollinated flowers of oaks produce acorns, an important food for wildlife. Many birds depend on this bounty of food, including Jays, Tufted Titmice, Red-headed and Red-bellied Woodpeckers, Ruffed Grouse, Lesser Prairie Chickens, Bobwhite and other quails, and Wild Turkeys. 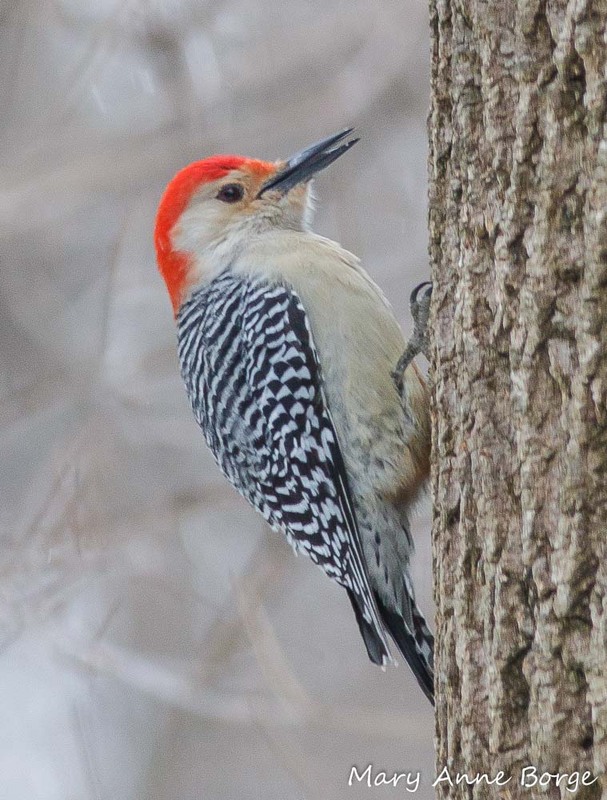 Red-bellied Woodpeckers are among the many birds that eat acorns. 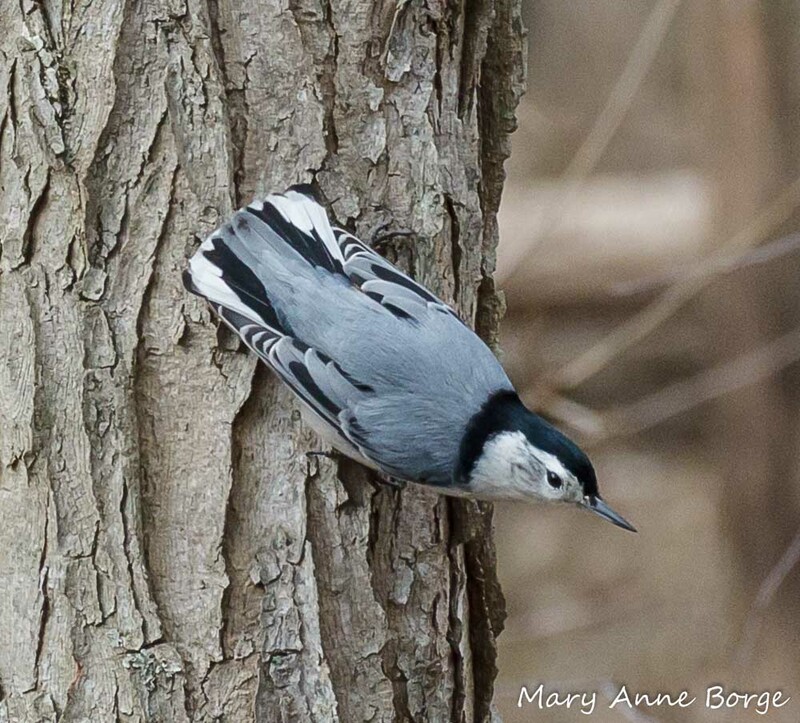 White-breasted Nuthatches are most often seen foraging for food, mostly insects, in the crevices of tree bark, but they also like fruit, and are named for their habit of tucking seeds and nuts like acorns into a crevice and hacking away at them to consume the tasty treat inside. They may also cache some acorns for later consumption. Even Wood Ducks consume acorns. They primarily live in forested wetlands where oak trees and acorns may be present. 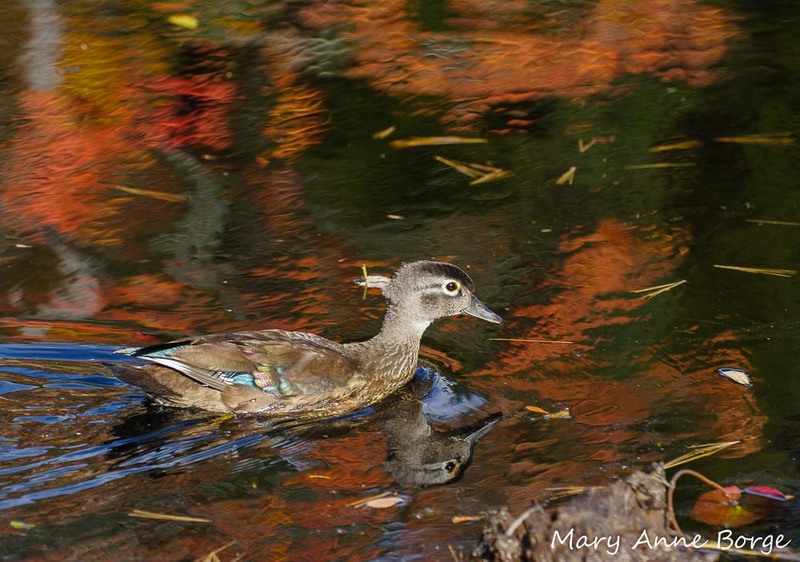 Wood Ducks are just one of the many animals that nest in tree cavities such as those found in oaks. Acorns are an important food source for many mammals, from mice, chipmunks, raccoons and squirrels, to bear and deer. 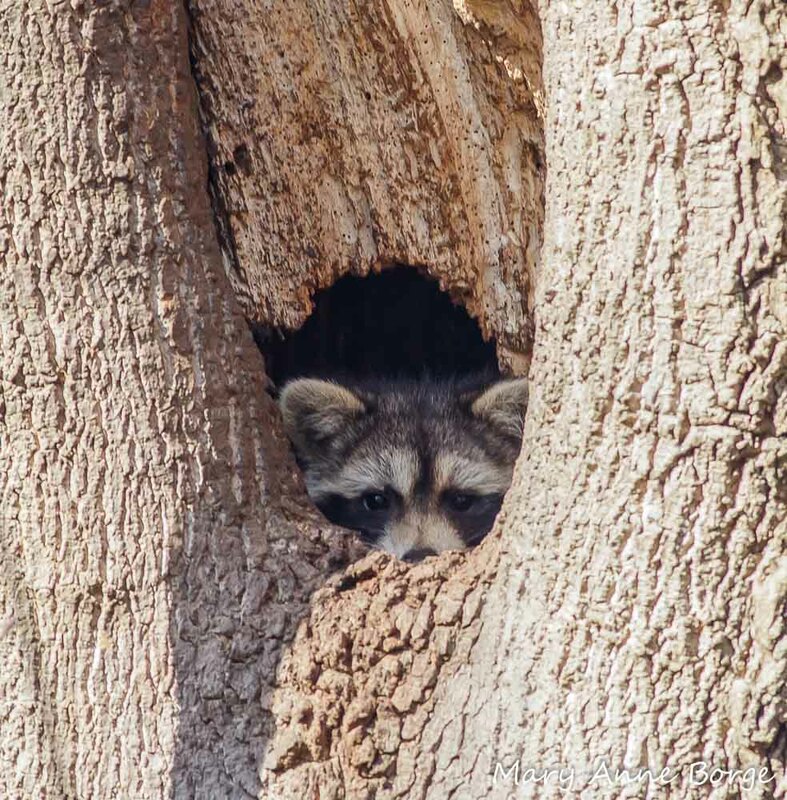 Raccoons are among the many mammals that eat acorns, and may find shelter in oak or other tree cavities. 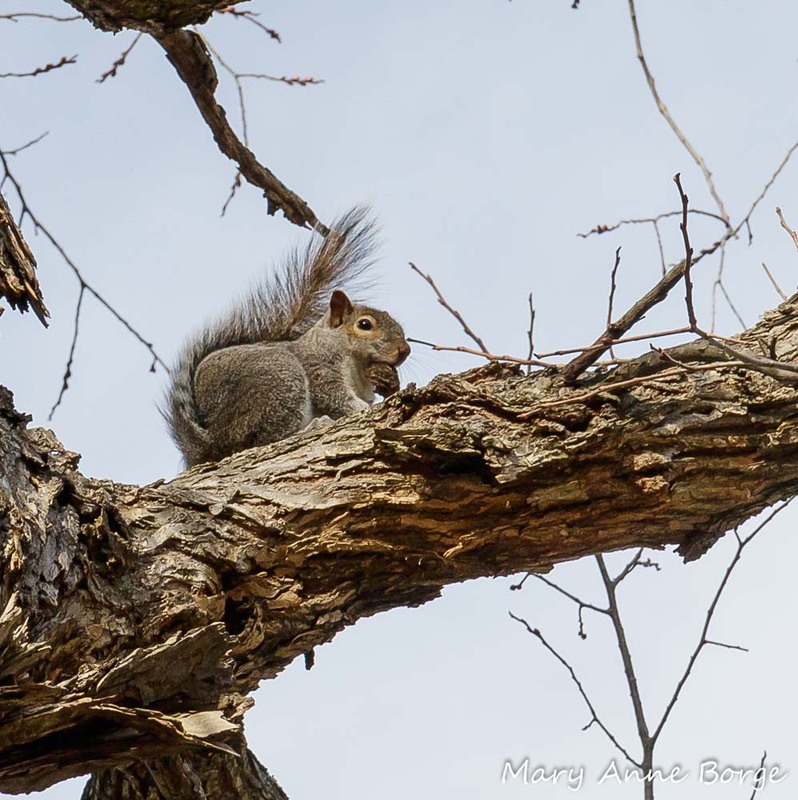 Eastern Gray Squirrels have a special relationship with oaks. Not only do they consume acorns and shelter in oak cavities, but in return they help to disperse oak seeds (acorns). Like the White-breasted Nuthatches, Gray Squirrels cache acorns for later consumption. Squirrels typically have a very good memory for where they stashed each acorn, often recovering as much as 95% of their hoard. But the other overlooked 5% may germinate and prosper in their new location. Oaks also tend to have ‘mast years’ when they produce more acorns than can be easily eaten even over the long winter. In such years, many acorns may live to become trees. Acorns are at their most nutritious before they germinate. Acorns of trees in the white oak group germinate in their first year. Squirrels can detect this, and are likely to eat acorns from the white oak group as soon as they are available rather than cache them. Trees in the red oak group produce acorns that take two years to germinate. Squirrels are likely to cache acorns from trees in the red oak group, since they remain a viable food source for a longer period of time. When acorns are plentiful, Gray Squirrels, Blue Jays, White-footed Mice and other acorn consumers tend to eat only about half of each acorn, the half at the opposite end from which the tree seedling will emerge (the end without the ‘cap’). This part of the acorn has a higher lipid content, the food these animals are seeking, and a lower tannin content, a bitter tasting compound that is off-putting to potential consumers. The discarded uneaten half acorn will often germinate and produce a seedling. 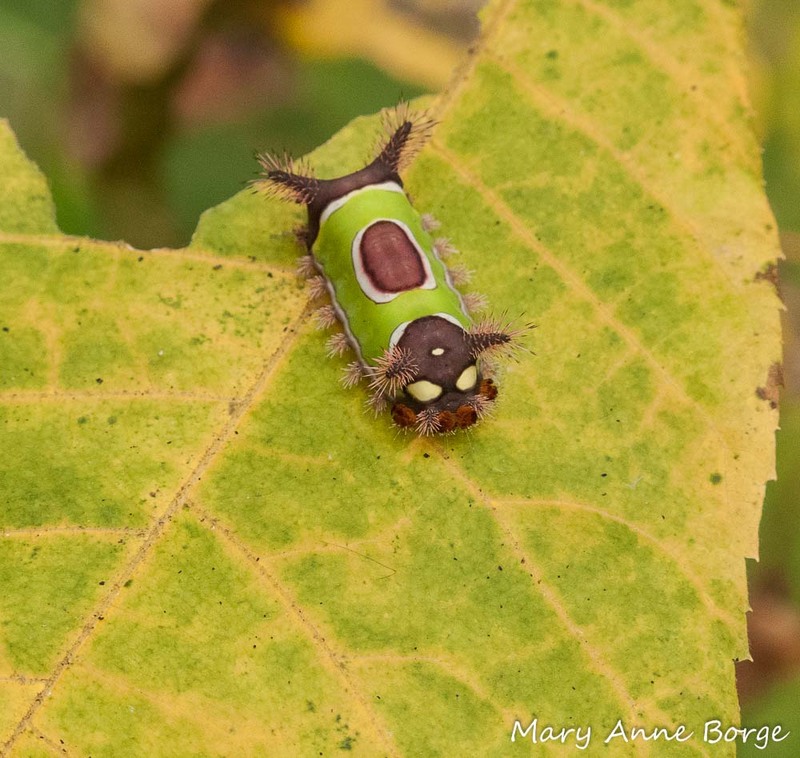 Studies have shown that in the mid-Atlantic United States, oaks are food plants for the caterpillars of more butterfly and moth species than any other genus of trees, supporting more than 500 species. 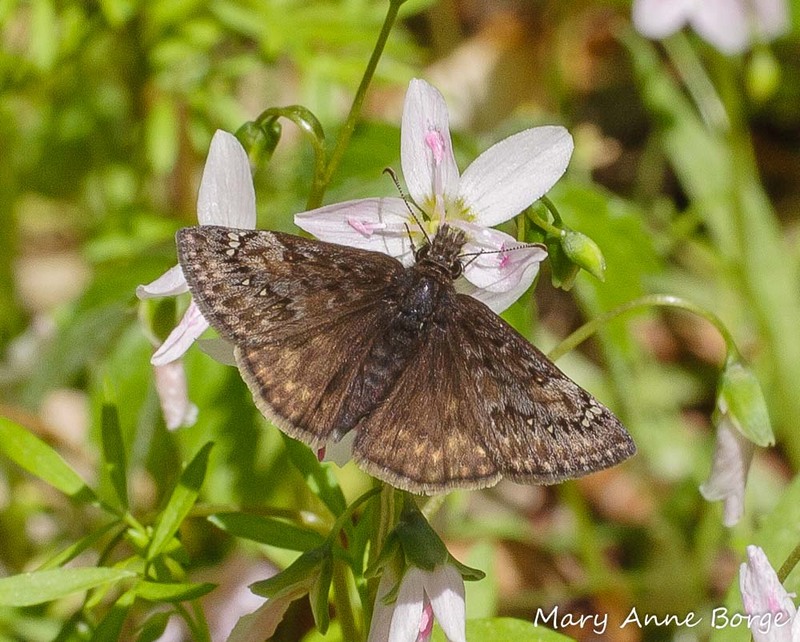 Juvenal’s Duskywing nectaring from Spring Beauty (Claytonia virginica). Several Duskywing butterfly species use oaks as caterpillar food. 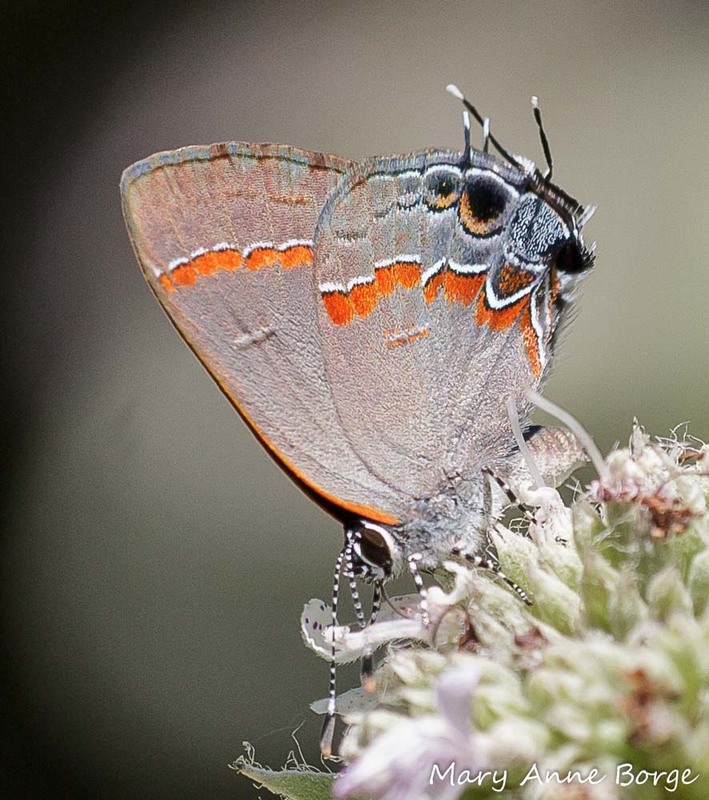 Red-banded Hairstreaks use the fallen leaves of oaks and sumacs as caterpillar food. The spend the winter in the fallen leaves. 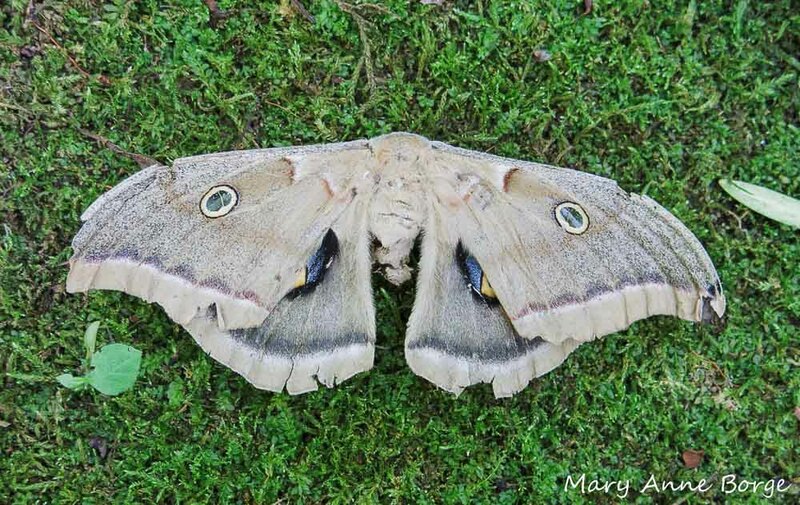 Several giant silk moths like this Polyphemous Moth and Luna Moths depend on oaks for caterpillar food. Insects, and especially caterpillars, are an important source of food for birds and other animals. It takes thousands of caterpillars to feed a young bird family. As a result, many of those caterpillars will become a meal before they get a chance to become a butterfly or moth. 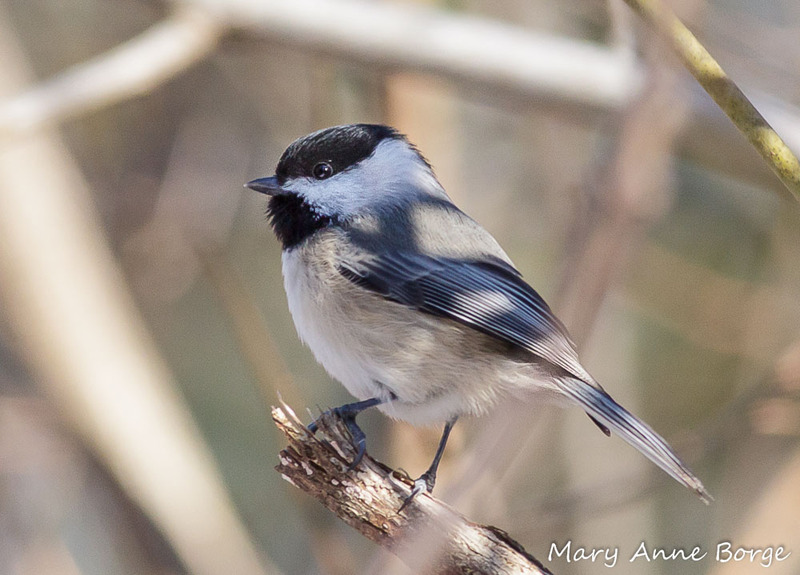 Carolina Chickadees need thousands of caterpillars to raise a single brood. 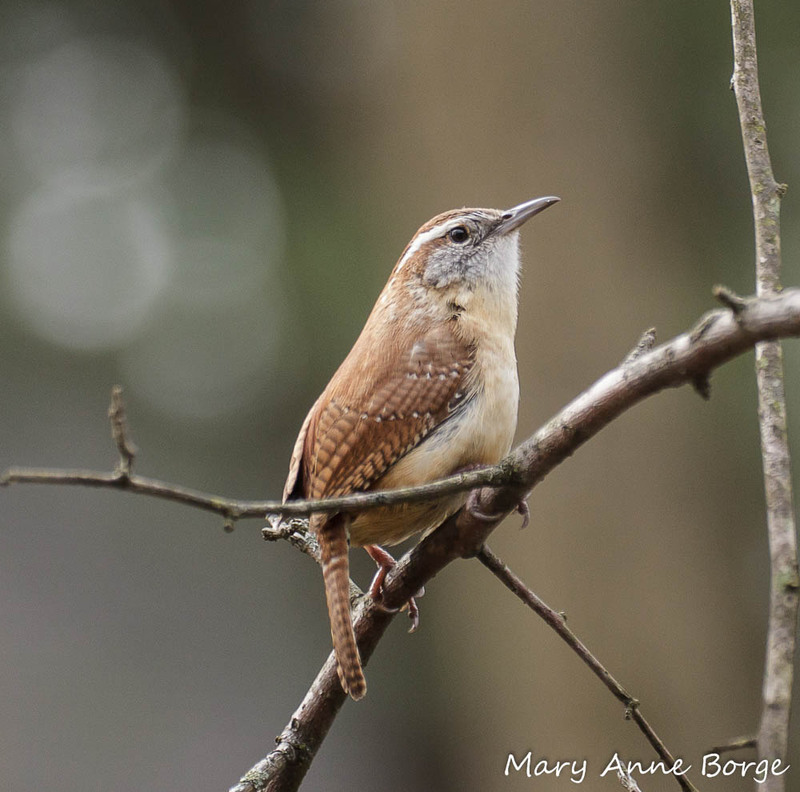 Carolina Wrens need food in the form of the many caterpillars and other insects found on oak trees. 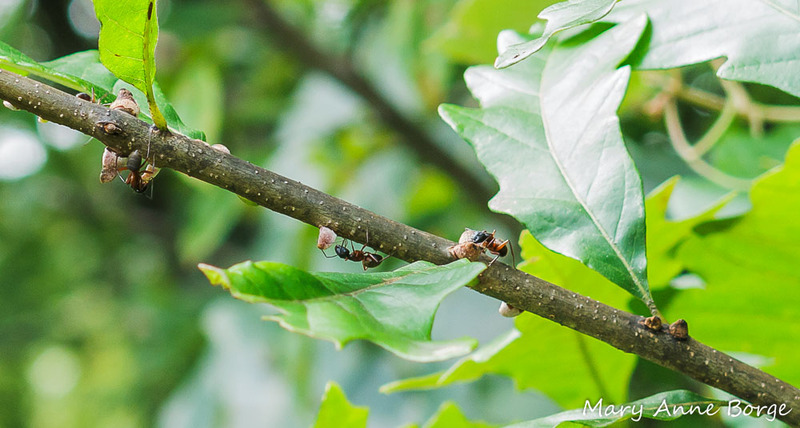 There are other insects whose presence in oak tissue stimulates the oak to produce a gall, an abnormal plant growth with more nutrients than are found in normal tissue. The insect develops inside the gall, feeding on the nutrient rich tissue inside. Some oak galls are caused by midges, but many are caused by members of a sub-family of wasps called gall (Cynipid) wasps. The galls take some of the plant’s resources, but they typically don’t cause any harm to the plant. Often these galls house additional insects, free-loaders (inquilines) that didn’t stimulate the tree to produce the gall but who live and feed in the gall, sharing it with the original tenant. 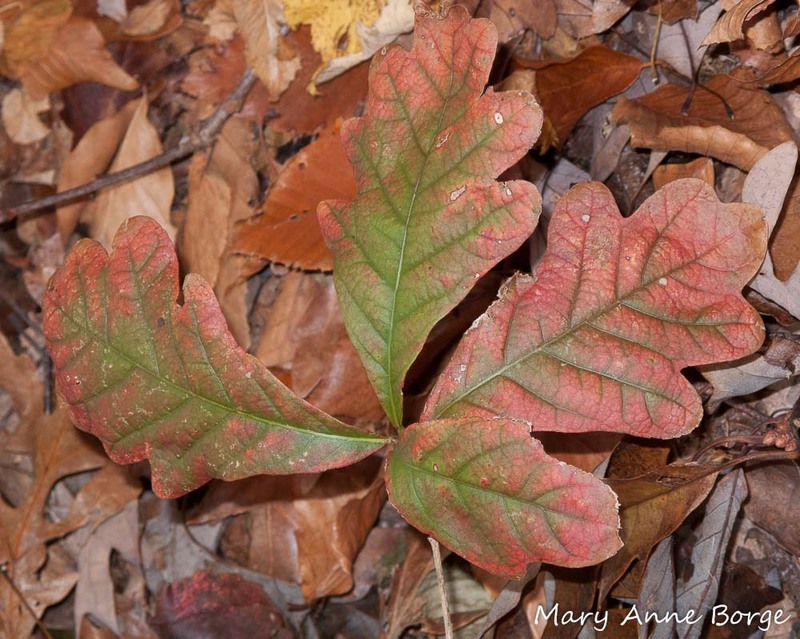 The galls on these Pin Oak (Quercus palustris) leaves are caused by a midge, Polystepha pilulae. 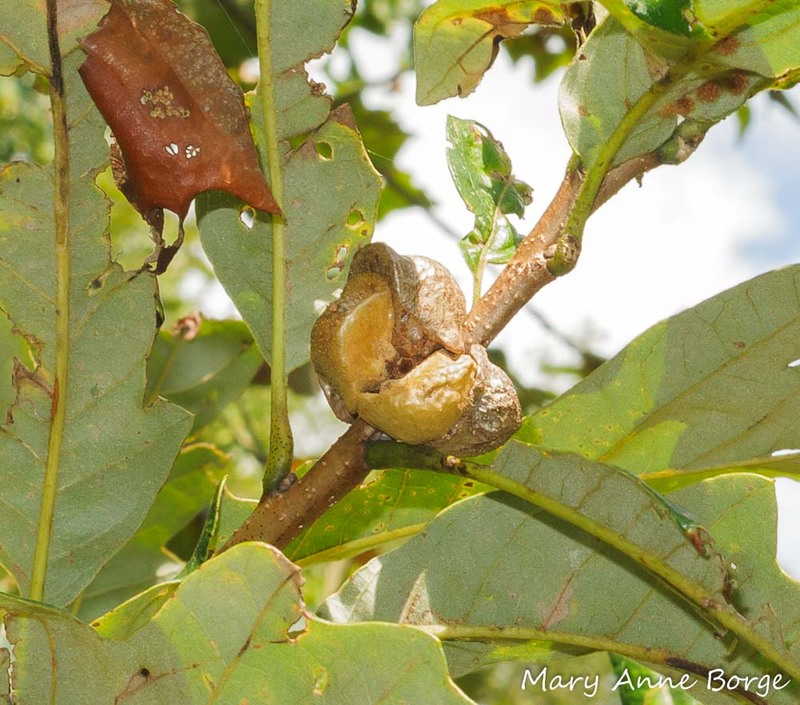 This gall on Swamp White Oak (Quercus bicolor) is called a Lobed or Pine Cone Oak Gall. It is caused by a wasp. 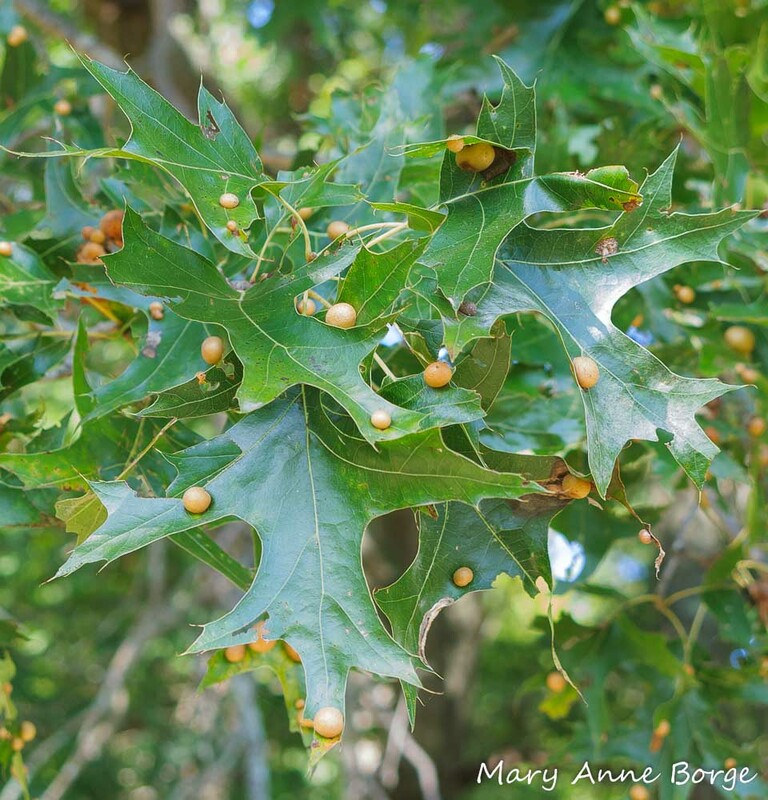 This summer my attention was drawn to a Swamp White Oak (Quercus bicolor) branch by ants rapidly climbing around on several ‘bumps’ that could only be galls. At this point the galls were somewhat nondescript little growths that turned out to be Oak Bullet Galls. But what attracted the ants to the galls? Ants are omnivorous. Other insects are important food for them, but they also eat plant material and sweet tasty treats, like nectar. Since they didn’t have access to the insects inside the galls, I speculated that there was something on the exterior of the gall that enticed them. When I looked at my photos, they did appear to be eating something, but what? When I checked on the galls about a week later, their appearance had changed dramatically; they now looked like red Hershey’s Kisses. The ants were still on duty, and this time when I checked my photos, I could see droplets of nectar oozing out from the sides of the galls. Mystery solved! 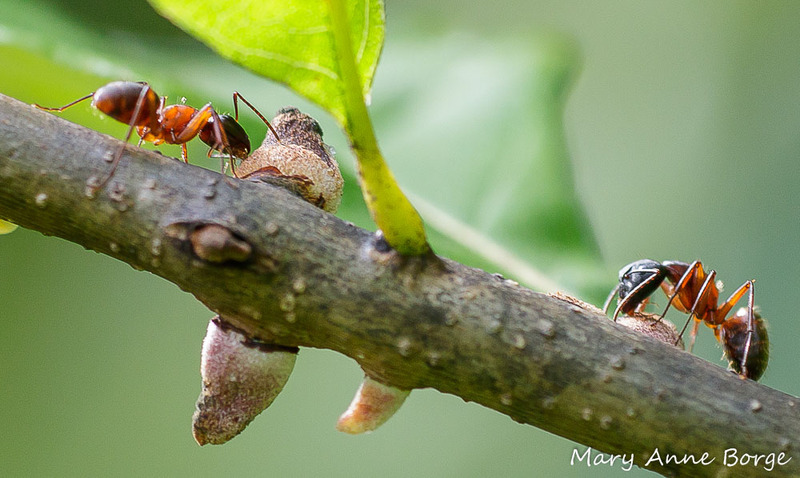 The wasp inside the gall had stimulated the tree to not only produce its home and food, but the home came equipped with a security system – nectaries to lure and pay for protection from predators. 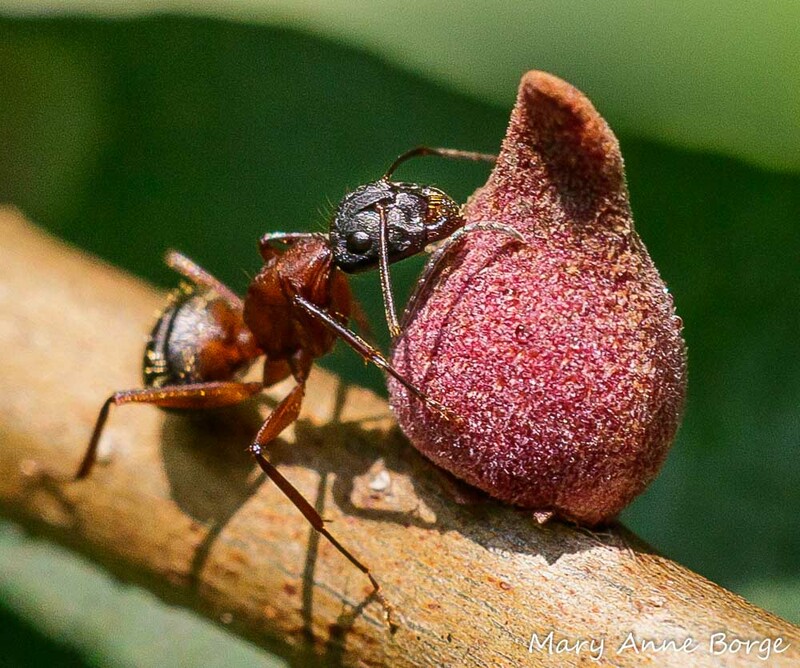 Ant drinking nectar from Oak Bullet Gall on Swamp White Oak (Quercus bicolor). The glistening nectar droplets are especially visible just below the tip of the ant’s right front leg. My next visit was about two weeks after the Hershey’s Kisses phase of the gall development. Their appearance had changed again; now each gall had a tan, almost perfectly round exterior. This time the ants were joined on patrol by several wasp species, each capable of discouraging predators of the gall wasp. 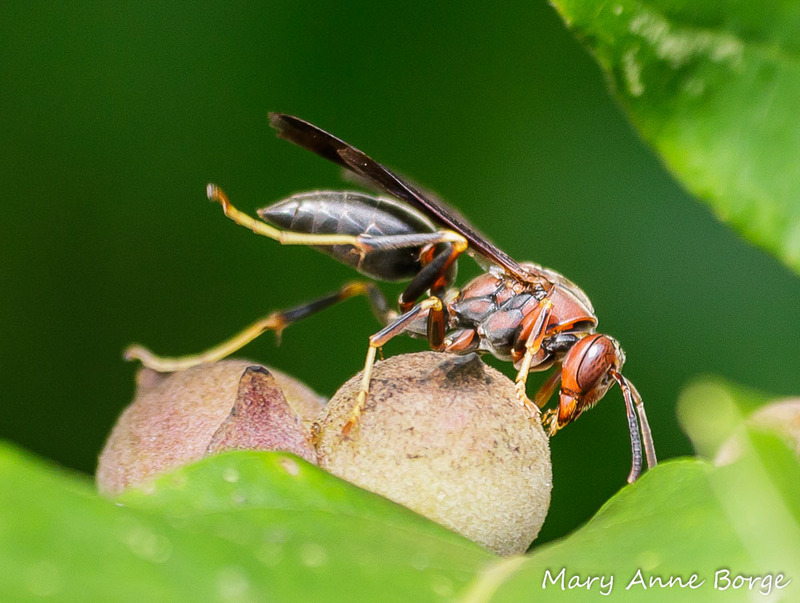 Paper Wasp drinking nectar from Oak Bullet Gall on Swamp White Oak (Quercus bicolor). 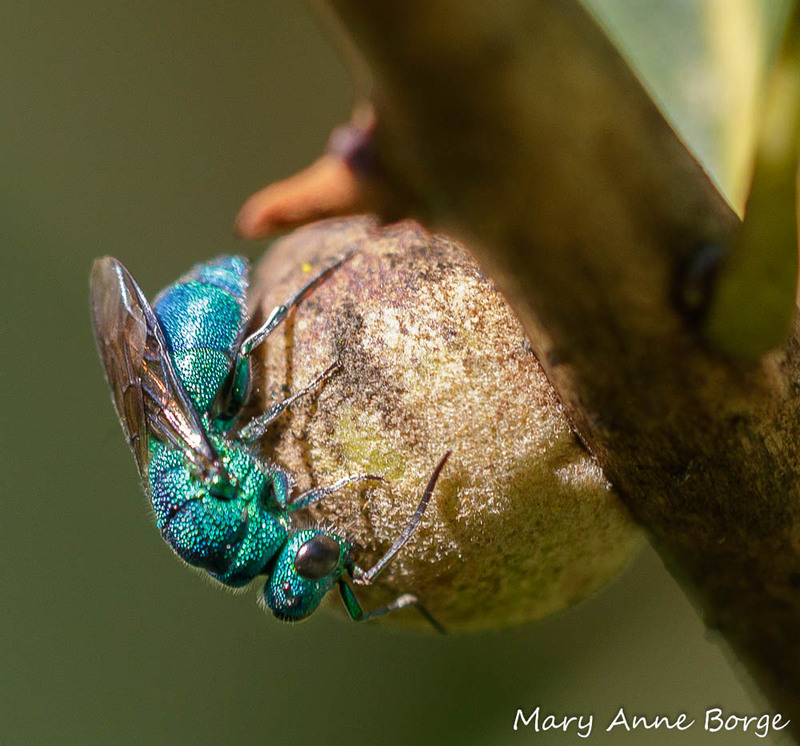 Cuckoo Wasp drinking nectar from Oak Bullet Gall on Swamp White Oak (Quercus bicolor). This seems like an expensive security service for the tree to provide if it only benefits the gall wasp. It is likely that many of these insect guards also protect the tree itself from other herbivores. For example, Paper Wasps, like ants, are caterpillar predators. Oaks also have relationships with many fungi, including species that are edible or provide medicine for humans, insects and other animals. 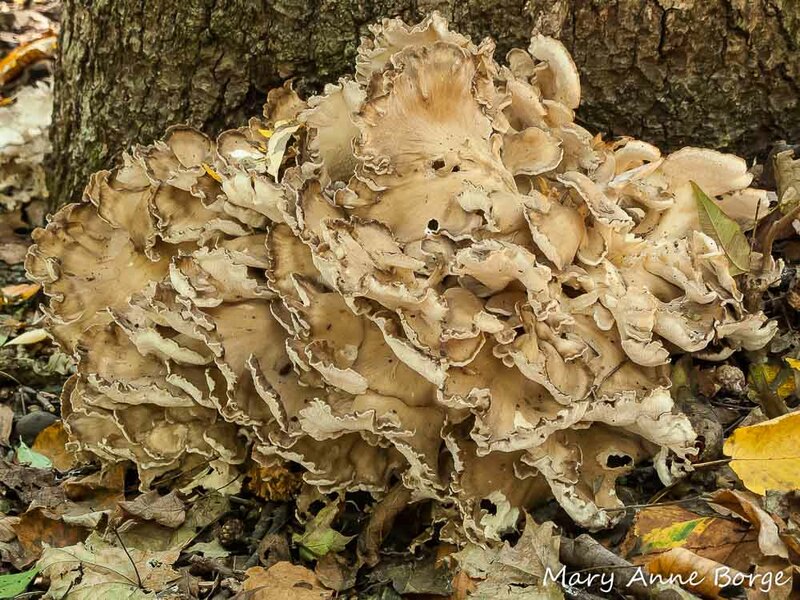 Hen of the Wood is just one of the many fungi that have a relationship with oak trees. 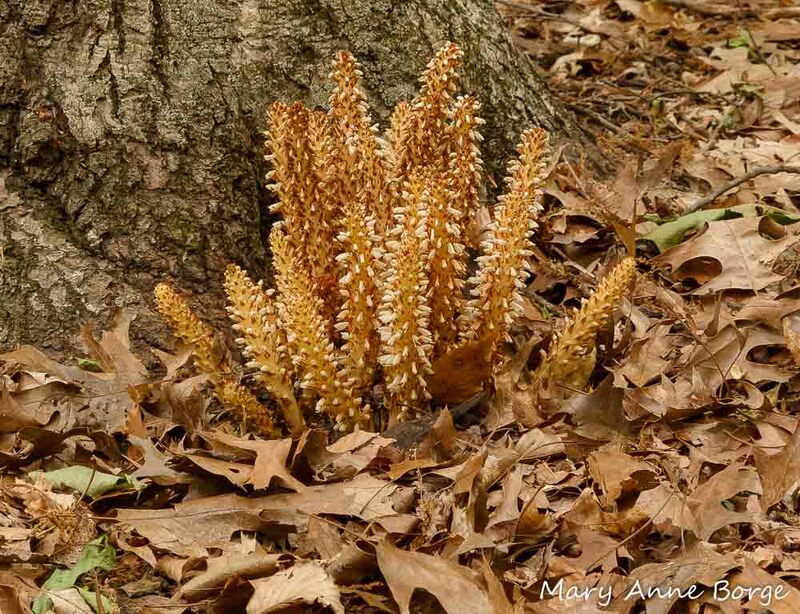 There is a plant called Squawroot or Cancer-root (Conopholis americana) that depends on oaks for its survival. Squawroot doesn’t produce its own food through photosynthesis. Instead it taps into the roots of oak trees for its food. How are oak trees beneficial for people? If prepared correctly, some acorns are edible. The wood is used for building, furniture and cabinet making. The bark of some species is used for tanning. Oak trees, especially the inner bark, have numerous medicinal uses. Most importantly, through photosynthesis, oak trees and other plants produce the oxygen we need in order to breathe. They help mitigate climate change by removing carbon dioxide and other pollutants from our air and water, providing cooling shade, producing moisture through transpiration, and helping to manage stormwater. Not only do oaks have a lot of gall, but they provide immeasurable value to life on earth. Eastman, John. Birds of Forest, Yard, & Thicket. 1997. Eastman, John. Birds of Lake, Pond and Marsh. 1999. Eiseman, Charley; Charney, Noah. Tracks & Sign of Insects and Other Invertebrates. 2010. Nelson, Gil; Earle, Christopher J.; Spellenberg, Richard. Trees of Eastern North America. 2014. Sibley, David Allen. The Sibley Guide to Bird Life and Behavior. 2001. Steele, Michael A.; Koprowski, John L. North American Tree Squirrels. 2001.